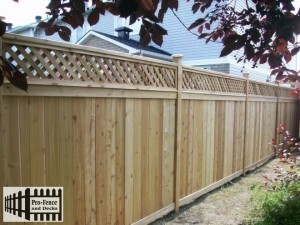 Pro-Fence and Decks Inc. Wood fence Installer/builder/contractor Ottawa. 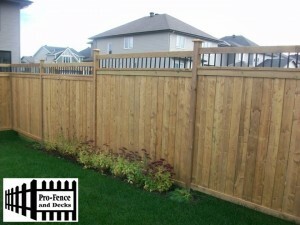 Wood fences are known for their quality, beauty, durability and their unique design for any residence or business in Ottawa and they are an affordable fencing option. Wood Fence have been the top choice for visual appeal and their endless styles and personal creativity for any Property. 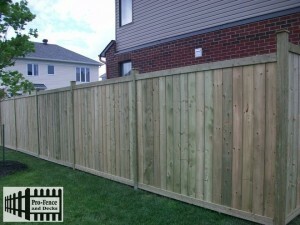 Wood fences can be treated or untreated and the maintenance of wood fences varies according to the type of wood. Wood fencing is vey popular for a residential perimeter because its cheaper than most of the fencing types and its easy to maintain. Westerns Red Cedar is the preferred fence because of its natural beauty, durability and appeal to any property. Western Red Cedar is the perfect choice for home owners seeking for comparatively price product because a renewable source and natural resistance to decay. It retains its shape and has twice the stability resist warping and twisting. Western Red Cedar know for its rich grains and vibrant colors that when its properly finished and maintained it will last for many years to come. All of the Western Red Cedar that we install is Premium Grade. MicroPro Sienna Treated Wood has become a very popular choice in Ottawa. The innovative color technology gives MicroPro Sienna Treated wood a rich and finished look to your Deck, Fence, Pergola or any outdoor living . It offers a finished look similar to cedar with no initial staining. MicroPro Sienna wood can be used above or below ground and in fresh water. It offers better corrosion resistance to exterior fasteners and hardware and it can be used in direct contact with aluminum building products. Pressure Treated Fence is a great choice when constructing a fence to your residential or commercial property due to their economical Value. Pressure Treated lumber main Idea is to increase the durability of the lumber against weather conditions and has no problem with contact of soil. Staining the Pressure Treated Fence is still recommended in order to exceed maximum protection and longer life span. Call us and one of our professional designers will work with you to help you create a perfect design to compliment your architecture or décor for your property. All of our Wood Fence complies with all the local building codes in the city of Ottawa, Ontario.